Iconic wall sized map of India by Faden. Iconic wall sized map of India chronicling the British military campaign in the subcontinent against Tipu Sultan of Mysore. This is Faden's magnificent mapping of the Indian subcontinent, one of the largest and most impressive maps of India to appear in the 18th century. Highly desirable third edition. Presented in two panels, as issued. This chart depicts the subcontinent from Bombay (Mumbai) and Aurangabad, south to include the northern half of Sri Lanka (Ceylon). Color coded according to political territory, noting British Possessions (red), the territory claimed by the independent holdout Rajah of Mysore (Purple), the Marhatta Countries (Green), the Nizam Dominions (Orange), the Carnatick (Yellow), and the Travancore (Blue). Includes the routes of various military marches and campaigns relating to the British conquest of India, including the 1784 March of British Prisoners from Condapoor to Madras, the March of the Marquis of Cornwallis, the March of General Medows, and the March of General Abercromby. Also shows the acquisitions of the British through the Partition Treaty of 1792. This map was engraved by R. Baker and printed in by William Faden, 'Royal Geographer to the King and to the Prince of Wales.' The whole is masterfully presented in visually stunning almost three dimensional engraving and stunning period color. A must for any serious collection of South Asia maps. Compiled from papers communicated by the late Sir Archibald Campbell, the surveys of Col. Kelly, Capt. Pringle, Capt. Allan, etc. Faden, W., General Atlas, 1800. Very good, near fine, example. Original centerfold. Extremely light offsetting. A couple of minor spots to the outer margins. A couple of period notations regarding the colonial activity in the region, some in pen, some in pencil. In two panels, as issued, but can be joined upon request. Rumsey 2104.047, 2104.048. Phillips (atlases) 6010, 6013, 6047. National Library of Australia, MAP RM 1792. Rennell, James, Memoir of a Map of Hindoostan; or the Mogul Empire, London, 1792. 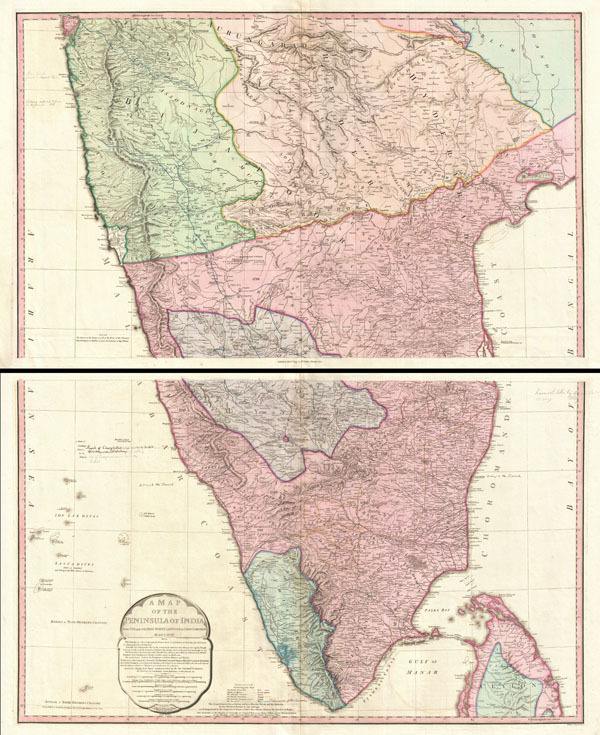 Edney, M. H., Mapping an Empire: The Geographical Fonstruction of British India, 1765-1843.